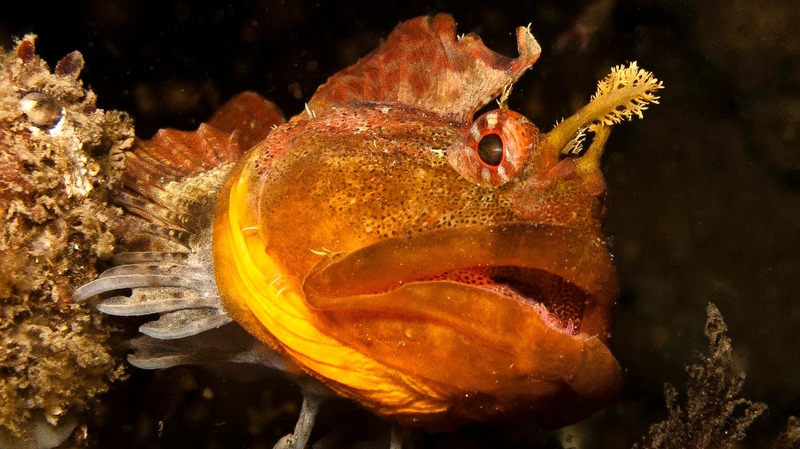 Scalyhead Sculpin- Ocean’s Best Dad? While small, the Scalyhead sculpin is a fierce protector of his eggs and will take on anyone who try to steal them. Scalyhead sculpin (Artedius harringtoni), also known as Plumose sculpin, uses camouflage to blend into its surroundings and avoid predators. Only about 4 inches long, they can be identified by their bright orange gill linings and cirri above each eye. Very active compared to most sculpins, they will dart about from perch to perch. A Demersal fish, meaning it lives and feeds on the bottom, they prefer rocky or gravel areas generally below 20’. Despite their size, Scalyhead sculpin have a big range along the west coast, and can be found from Aleutian Islands all the way down to Southern California. Divers can find Scalyhead sculpin near intertidal areas around rocks and pilings. Both a forager and a predator, they have been known to eat the eggs of Lingcod. Males will choose a suitable nest, then wait for a female to approach and enter the nest. Reproduction is through internal fertilization, then the female will lay her eggs and leave. The extremely territorial males then take full responsibility for protecting the eggs until they hatch. Scalyhead sculpin are not considered threatened at this time. Scalyhead Sculpin – Who’s Your Daddy?